Shouldn’t be too hard to decide what that is! Horror stories abound – and it must be one of the few plants ever legislated about. Yet it all started out innocuously enough on a beautiful country estate in Mid-Wales in the 1880s. 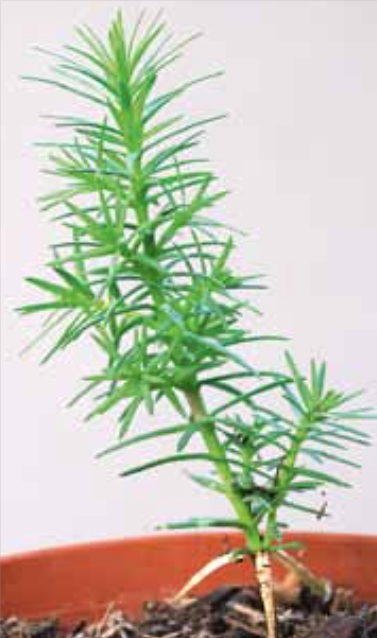 I’m referring, of course, to that chance cross between the Nootka cypress and the Monterrey cypress which currently rejoices in the botanical name of x Cupressocyparis leylandii although it’s better known as just Leylandii. 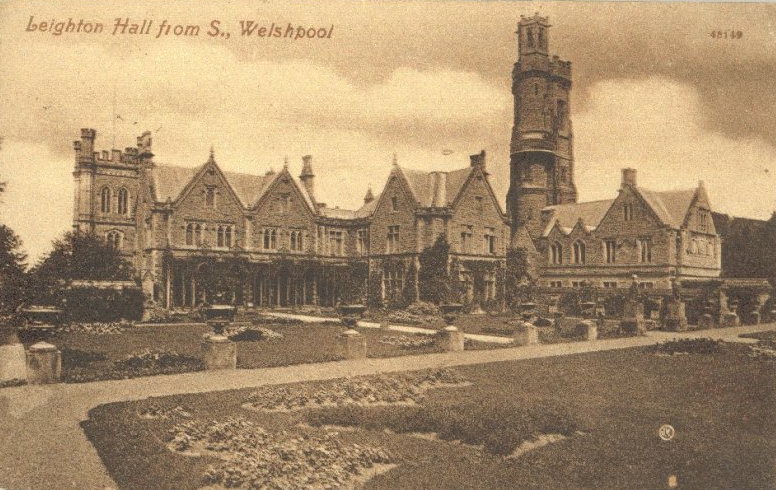 Read on to discover the amazing Welsh estate where it all started, why it almost didn’t happen, and then how the monster was encouraged in the name of horticulture! 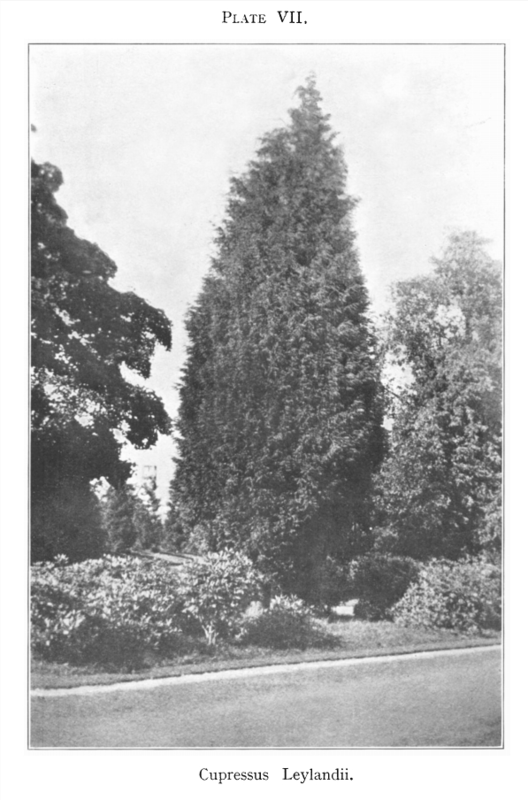 The story of the Leylandii begins in 1847 with a rather impressive wedding present. When wealthy Liverpool banker John Naylor got married, his even wealthier uncle, Christopher Leyland, gave him a house. 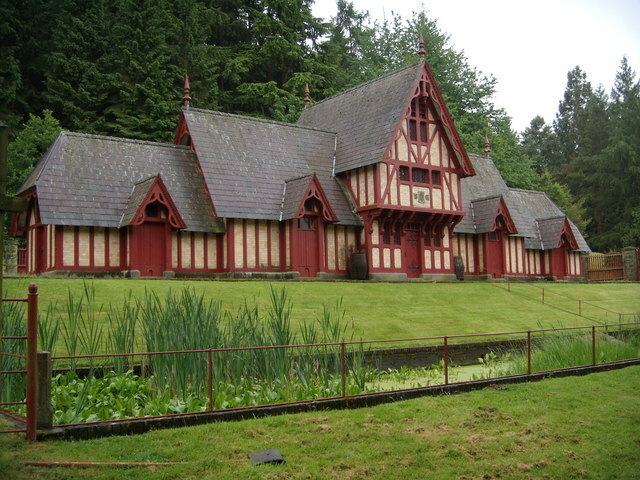 Not just any old house, of course, but the Leighton Hall estate near Welshpool in Montgomeryshire, which centred on a Tudor house set in a deer park. 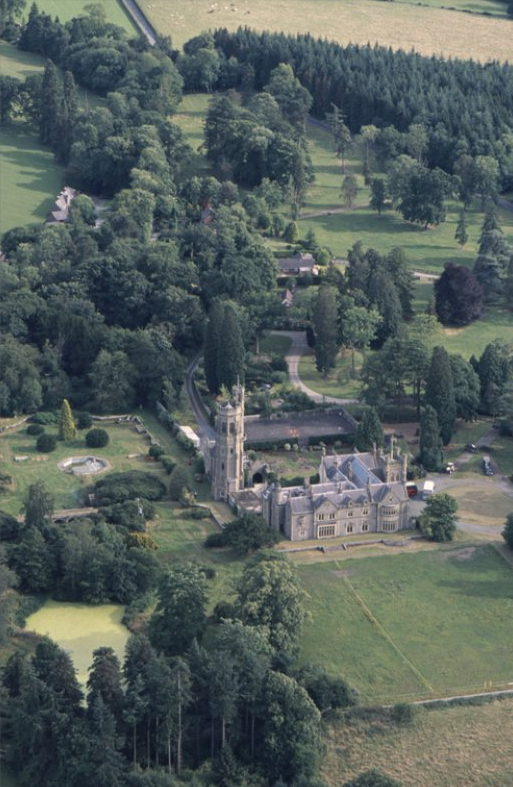 Leighton Hall, from the Peter Davis Collection at Parks and Gardens UK. Leighton Hall taken by RCAHMW 2005. Naylor immediately began a process of modernization. 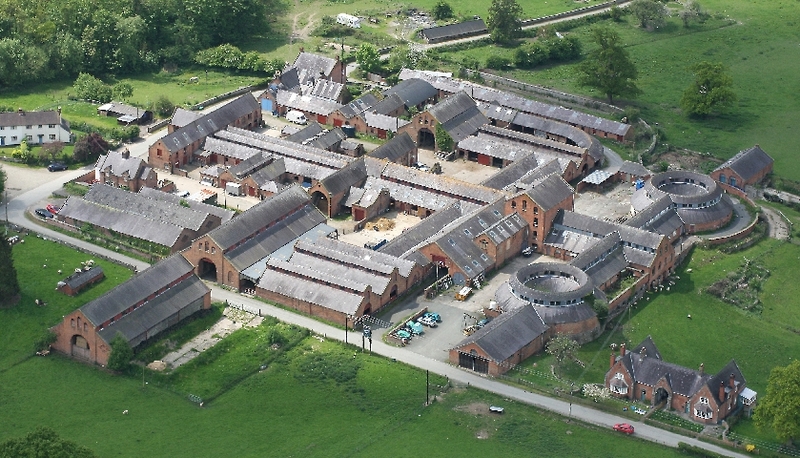 He rebuilt the house in the romantic Gothic style, installed steam-powered central heating, built an estate gasworks, and a six-story observation tower, at a reputed cost of £275,000, and then spent an additional £200,000 on a huge industrial scale Victorian farm that used pioneering technology. The house interiors were designed Pugin and carried out by the Craces, and Naylor commissioned Edward Kemp to landscape the grounds. © Copyright Colin Lea and licensed for reuse under this Creative Commons Licence. Edward Kemp had trained under Paxton at Chatsworth in the 1830s and in 1843 was asked by Paxton to charge of Birkenhead Park, where he remained as superintendent for 40 years.This did not stop him working elsewhere and in 1850, writing a successful ‘textbook’ : How to lay out a garden: intended as a general guide in choosing, forming, or improving an estate … with reference to both design and execution which ran through several editions. Gardener’s Chronicle called it ‘the best book on pure garden design in the English language’, (19 June 1858, p.496). 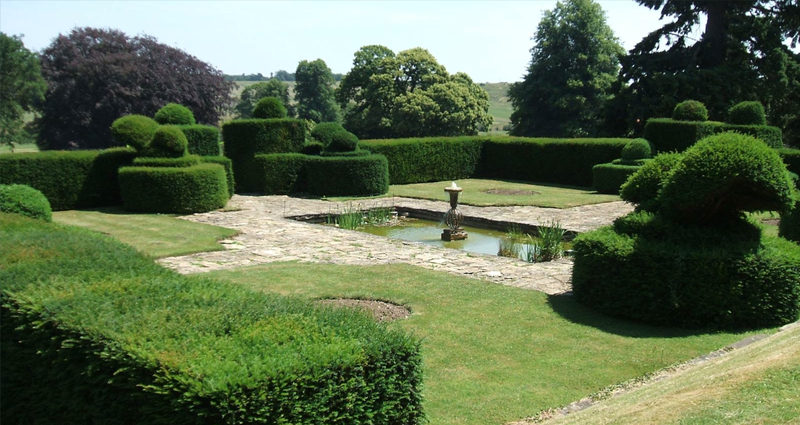 Kemp laid out formal gardens around the new house in a style that he referred to as ‘architectural gardening’ in his book. Most of these have now vanished, although the basic layout survives. 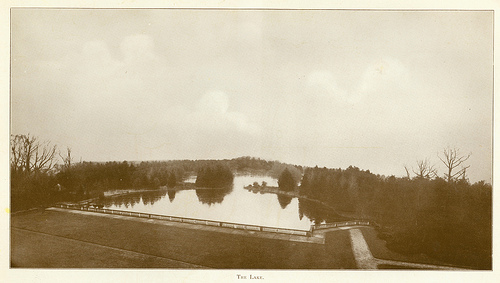 He also designed pleasure grounds complete with evergreen shrubberies with winding walks and ornamented with summerhouses, a decorative water cascade, and a newly fashionable camellia house. There was also a mini-menagerie with bison and kangaroo roaming parts of the estate. When you see the house at the foot of the hill you can see why he also installed a small funicular railway! 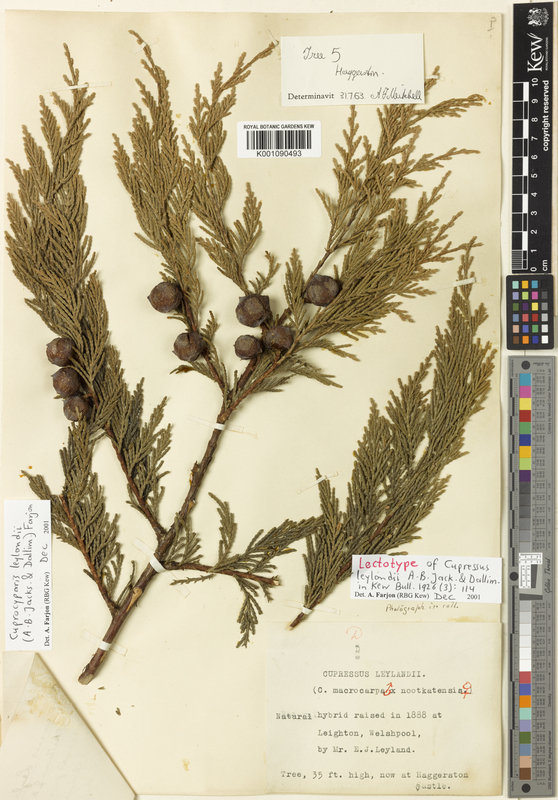 Both Naylor and Kemp also followed the fashionable craze for conifers which had been sweeping Victorian Britain since David Douglas and William Lobb, amongst others, starting introducing new species from the west coast of north America. 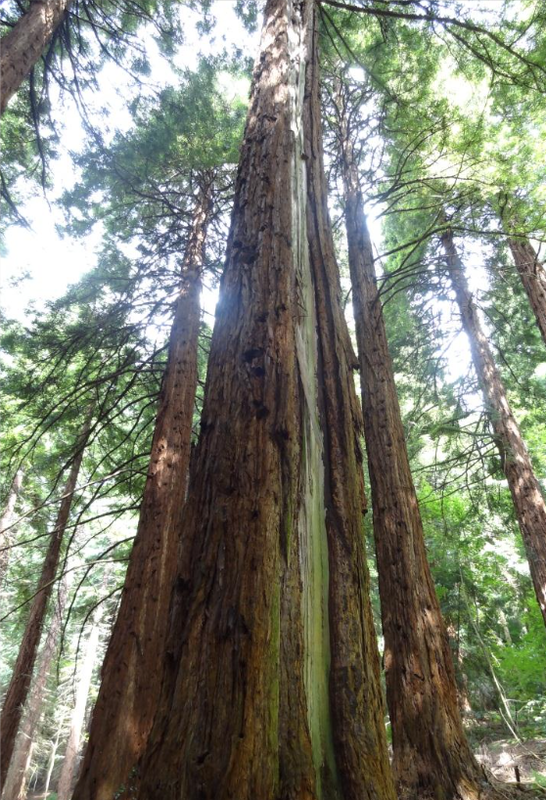 A grove of coastal redwoods was planted in about 1857, and is now the largest and oldest in Europe, with some trees exceeding 40m. It was extended into a pinetum over the succeeding decades with specimen pines, firs, monkey puzzles, spruce, hemlock and cedars. Together they now form an arboretum that is Grade 1 listed and managed by the Royal Forestry Society. 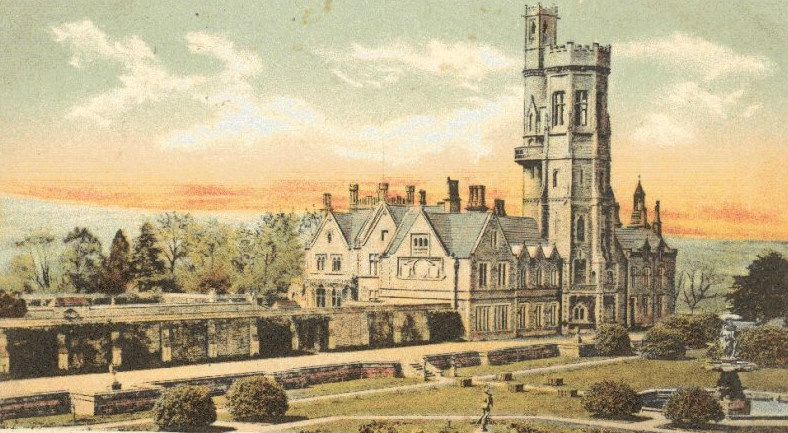 It was at Leighton Hall that John Naylor’s son, Christopher, was born in 1849. 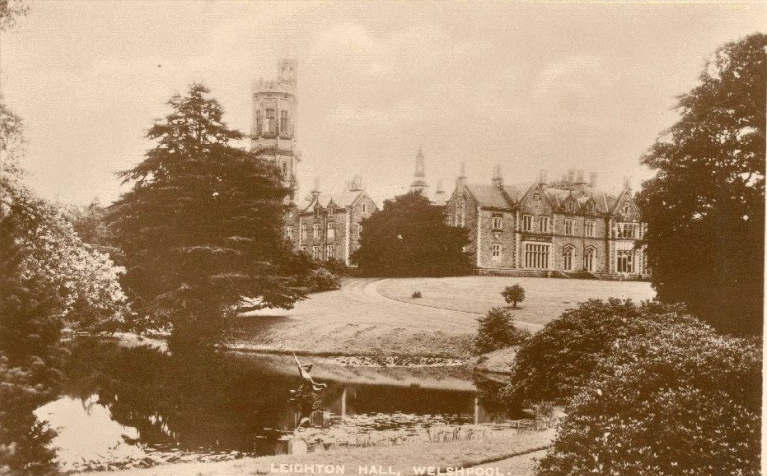 After a career in the Navy he returned to Leighton Hill and worked on improving the estate, particularly its forestry. 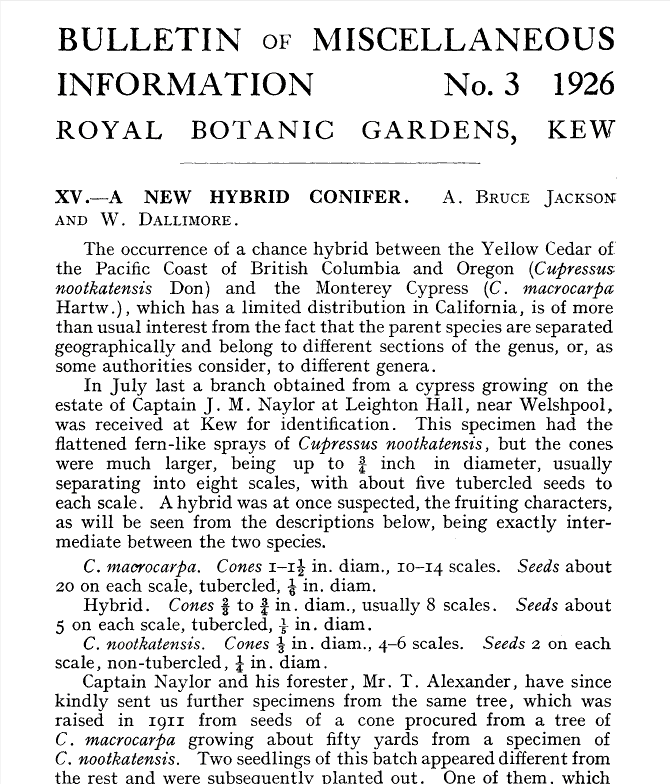 In 1888,in the pinetum nursery he noted amongst a batch of Nootka cypress seedlings, six with unusual characteristics. These are now thought to have occurred from their accidental cross-pollination from a Monterey cypress that had been planted nearby. 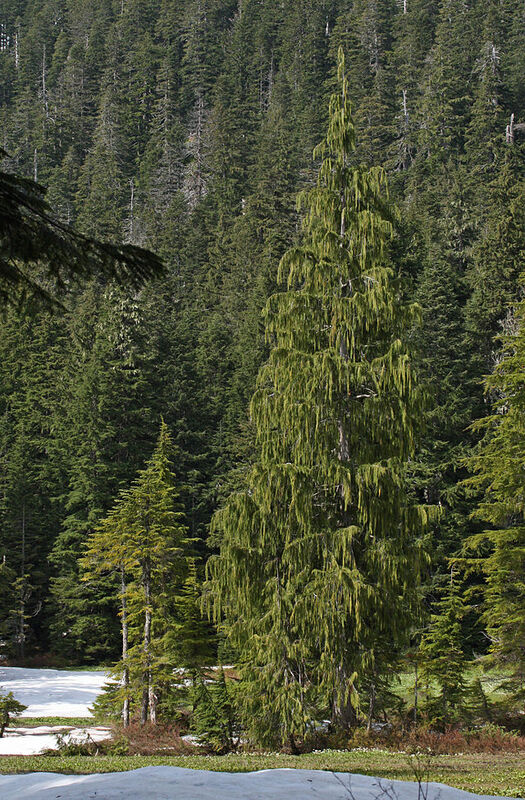 In the wild these trees have habitats hundreds of miles apart, but must be closely related. Since then there have about 20 reported natural hybridization between the two species, always by open pollination, whilst attempts to hybridized artificially have failed. 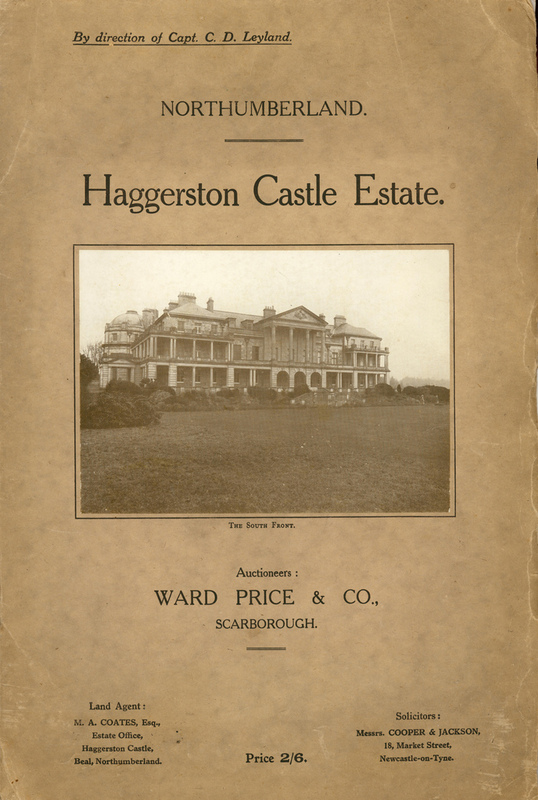 Two years later in 1891 Christopher inherited Haggerston Castle in Northumberland from his great uncle. 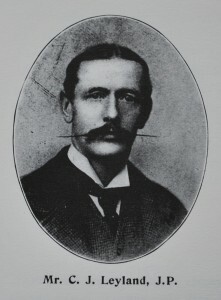 Changing his name to Leyland in memory of his benefactor, he decided to move there, giving Leighton Hall to his nephew Christopher John Naylor. 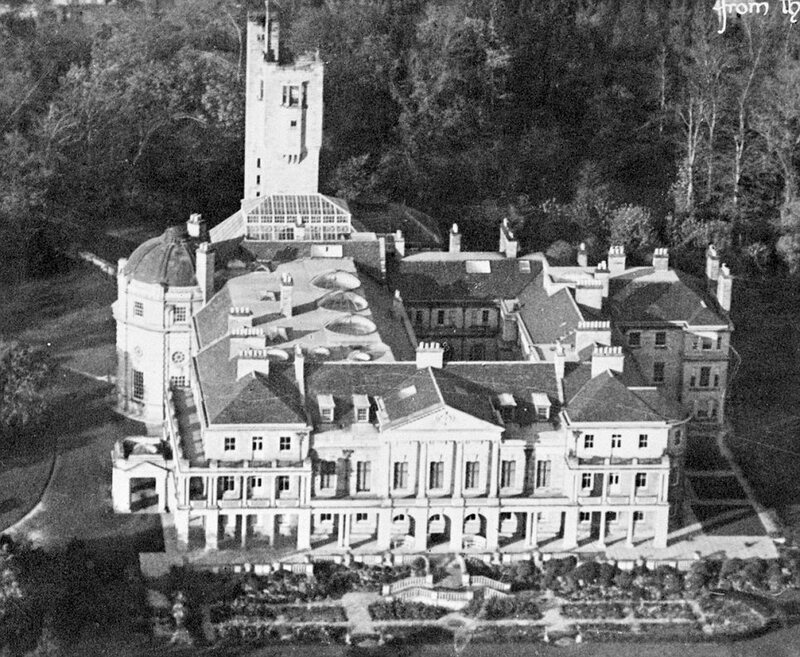 By 1893 Leyland had largely rebuilt the main house on a grand scale including an observatory, rotunda, ballroom and concert hall There was electricity and coal-fired central heating too. 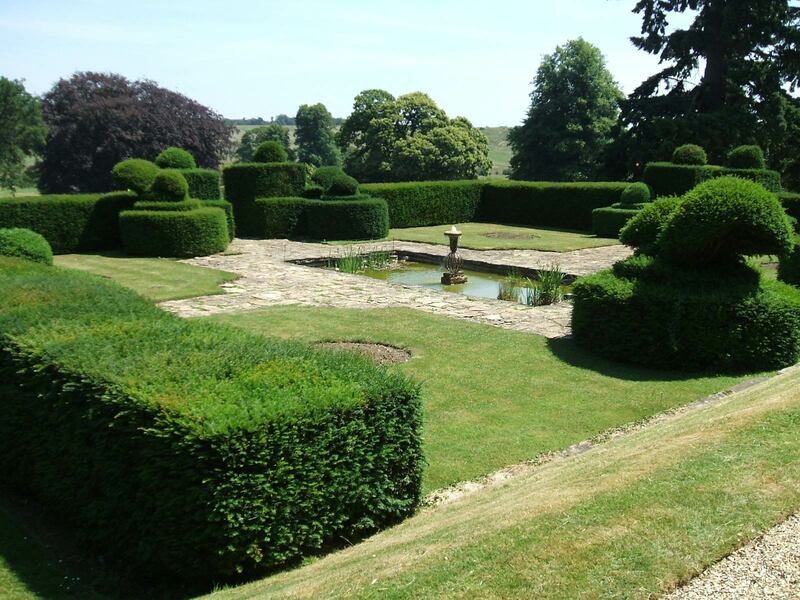 He also designed a large Italian garden and oversaw the landscaping of the 23,000 acres estate. [See The Garden, December 2005). Unfortunately we do not have an entry on our database for Haggerston so if anyone knows much more about it please get in touch. But Leyland did not leave everything behind at Leighton Hall….and guess what? 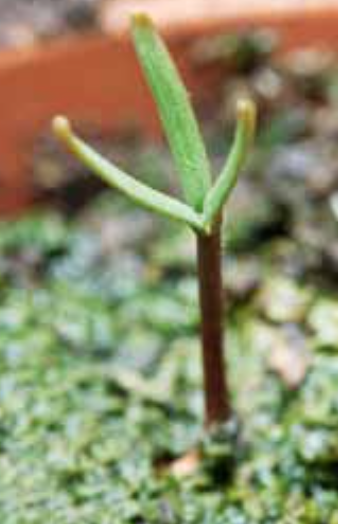 Amongst the things he took from Wales to Northumberland were the six seedlings… now not quite so small. 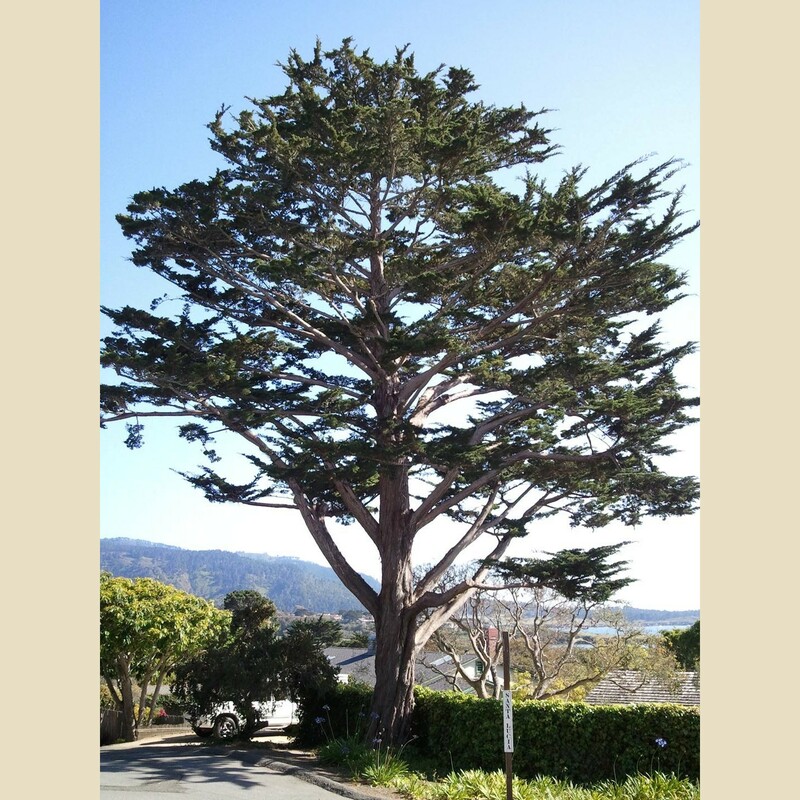 They were planted out at Haggerston and to his surprise, they not only tolerated the cold salt-laden winds from the North Sea but they grew at the rate of about a metre a year, evidently combining the rapid growth of the Monterey cypress with the hardiness of the Nootka cypress. 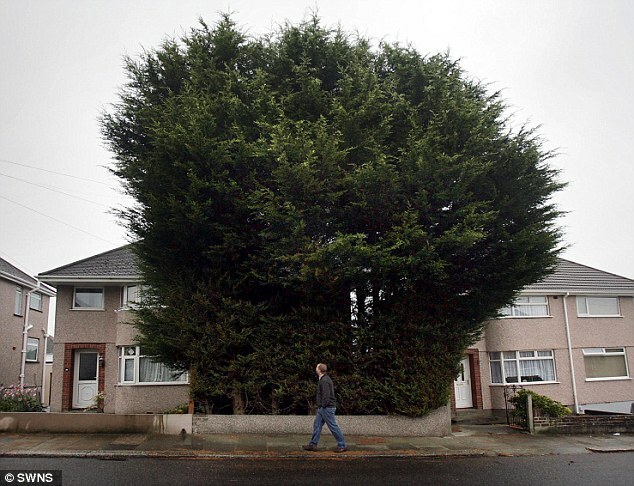 He took cuttings and planted them around the estate, calling them Leyland cypress but did nothing else much to publicise his unusual trees. It was not until 1925 after a visit by arboriculturalists to see some other ‘new’ trees at Leighton Hall that news got out. These ‘new’ trees were the result of a similar natural cross between the Nootka and Monterey pines which ha dbeen ‘discovered’ and then planted out in 1911 by Christopher John Naylor. According to Alan Mitchell [The Garden, November 1979] in 1916 cuttings were sent to Bicton and Inverary Castle and probably Headfort. They all grew extremely fast. Mitchell reports them as all being 30m and above. In 1925 foliage from these crosses was sent to Kew, and botanists Bruce Jackson and William Dallimore formally described the new hybrids as Cupressus x leylandii in the Kew Bulletin in March 1926, which also told the story of both sets of seedlings. It would appear that Dallimore and Jackson also went to Haggerston to see the six transplants – one of which was now 35ft – and obtained material from the trees not just for formal botanical description but also for propagation. It was from their cuttings that the first trees at at Kew, Wisley , Bedgebury Pinetum in Kent , and the Royal Botanic Garden in Edinburgh were grown. Hilliers were sending out plants commercially from 1930. 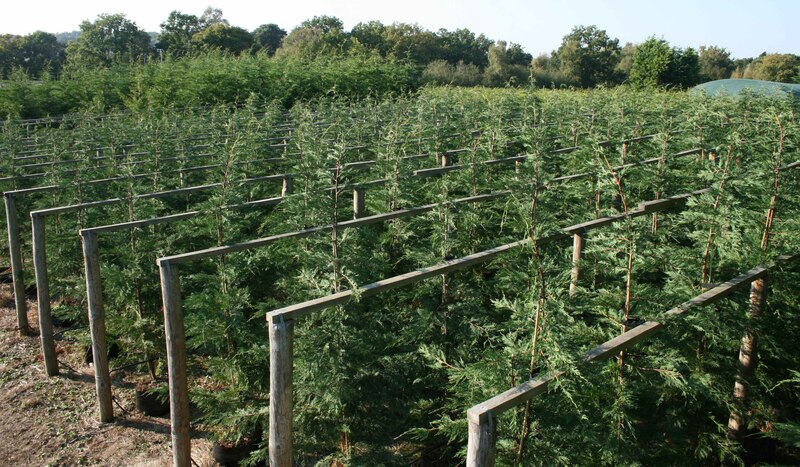 Leyland cypress soon entered commercial production because of their ability to cope with difficult conditions and provide shelter quicker and more effectively than most other species. But as a hybrid, it was generally assumed their seeds would be sterile, and that they therefore had to be propagated vegetatively from cuttings. 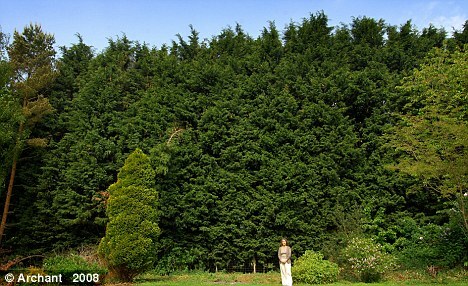 Recently James Armitage of the RHS has conducted experiments that seems to show that in fact Leylandii can [horror of horrors] in fact set fertile seed, although they are self-sterile and require a nearby compatible pollen donor, backing up some earlier evidence of this from New Zealand. [The Plantsman, December 2011]. Haggerston suffered a worse fate. 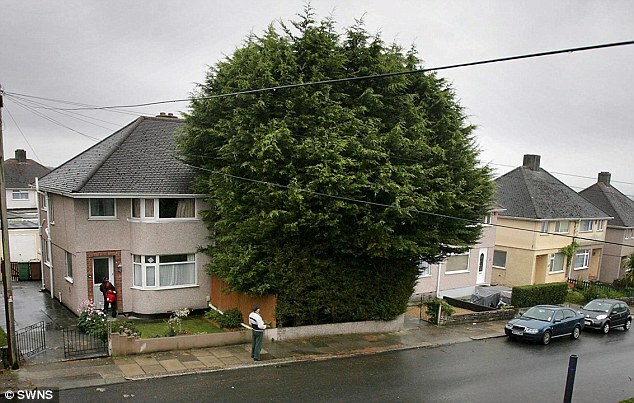 Christopher Naylor/Leyland died just after his tree was ‘discovered’ by the outside world in 1926. The tower and the rotunda remain standing and form the centrepieces to a caravan and holiday park. In July 2006 there were reports that the Italian walled garden which had survived hidden behind a large black gate were going to be restored, but I’ve not been able to find out much more. I did however discover some film footage from 2010 which shows how much further there is to go…although the potential for something truly spectacular is clearly there! 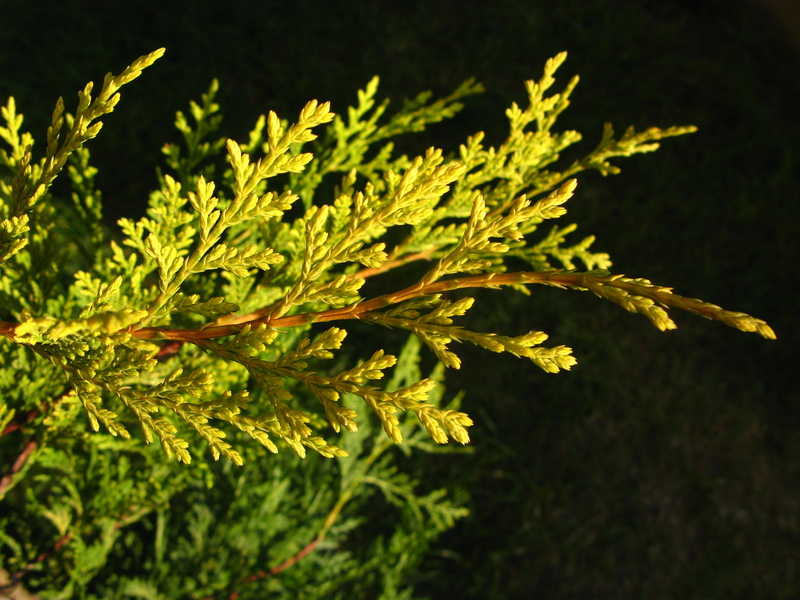 For many years the Leyland cypress was the biggest-selling item in every garden centre in Great Britain, making up to 10% of total sales. It has also been exported to virtually every country in the world with varying degrees of success. 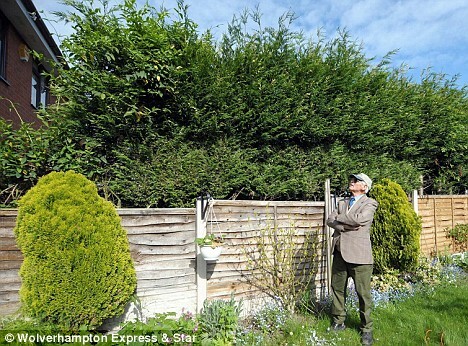 Of course what buyers tended to forget is that although their new hedge grows rapidly and soon creates the privacy and shelter they require, it does not then politely stop growing. Instead it demands requires very regular trimming to keep it in check. 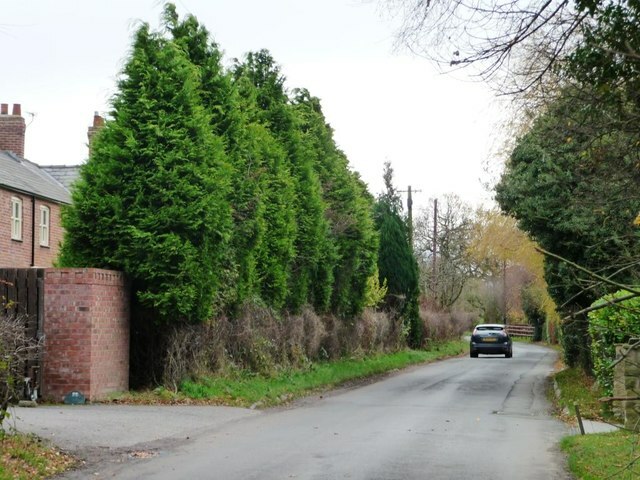 If that is done it’s a very effective hedge and can be maintained at almost height BUT If that isn’t done, equally quickly, it become a scourge of many neighbourhoods by growing too tall and causing boundary disputes. Since the tallest specimen is now 130ft high and still growing rapidly there are probably going to be a lot more problems to come! Meanwhile commercial nurseries are trying, through careful selection, to create a new generation of Leyland cypress seedlings, supposedly better suited to small gardens! This entry was posted in Uncategorized and tagged Edward Kemp, Italianate garden, kew, Leylandii. Bookmark the permalink.